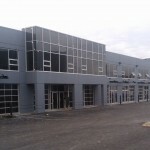 Another one of Don Viner and Nelson Chung's units at 22091 Fraserwood Way have completed. Patsy Hui of Re/Max has also been involved in the sales of these units. The unit sold for $330,500, representing a price per square foot of $163. The total square footage of the unit is 2,023, and is a ground floor office unit facing the highway, with a side grade loading door.